Winterama is a tradition unique to our community annually held on the third weekend of February. It is a ritual of community spirit and pride; a celebration of our heritage, our culture and our homecoming, gathering families, friends and acquaintances in seasonal celebration. Winterama weekend is upon us! Many people know this time of year and look forward to it. For those of you unfamiliar with Winterama, you’re missing out. Winterama is Penetanguishene Ontario’s winter festival. Many communities have their own version of a winter carnival – this is ours. Winterama in Penetanguishene is the oldest winter carnival in Ontario – this year marks the festival’s 66th anniversary. 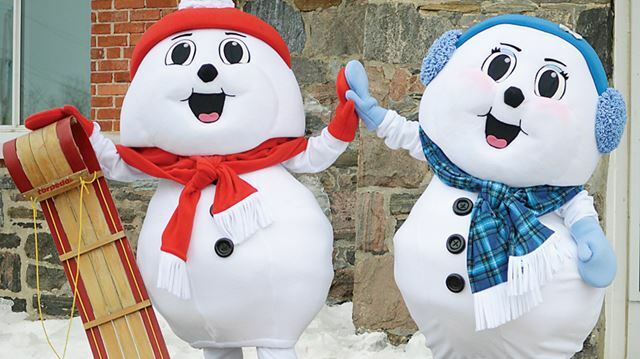 The mascots, Millie and Willy, have been around for a LONG time and just this year received a makeover. I think they’re cute. Some of my favourite events include the parade, fireworks, cardboard toboggan races, ice jumping, polar dip, ice sculptures and more. I have so many childhood memories surrounding Winterama. I remember being a kid, going to the parade with my family, walking to Memere & Pepere Pilon’s afterward for homemade pea soup, homemade chili, homemade bread and more. After a massive and delicious lunch, we’d check out the ice sculptures, go to the book sale, watch the cardboard toboggan races and more. Years ago Winterama included an annual demolition derby which has been discontinued for what I can only imagine are insurance purposes. I always loved that event as a kid! Who am I kidding, I’d still love that event now. I was even IN the parade once. I was a giant bottle of 10W40 oil. Don’t ask. I was still very excited – it was a big deal to a 10 year old to be in a parade. I waved my little heart out while tossing candy to the crowd. It was awesome, I felt like a celebrity. I found this old photo online from the 1994 cardboard toboggan races. The people who enter this race go all out. I remember this year. I remember those entries. I bet if I zoomed in I could see a geeky(er) little kid version of myself in that crowd. That was 20 years ago after all! Things have changed over the years and I don’t always check out all of the events, sometimes none, but this year I’d like to take in as much as I can. The festivities kick off tonight. Fireworks are taking place at 8:30pm, and the parade is tomorrow morning at 11:00am. I’ll be there, camera in tow, hoping to get a few shots of parade goers, floats and more. One thing I am VERY excited about is that the Smoke’s Poutinerie food truck will be in town! Check out the Winterama website and itinerary, or download the brochure for all of the 2014 event information. Penetanguishene Ontario Winterama runs February 14 – 17, 2014. **UPDATE** – click here for photos from Winterama 2014!